Committees with waterway constit- uents; and (2) members of Congress not on these committees but repre- senting waterway districts or states. March reported out legislation in- tended to allow all off-highway us- ers to purchase diesel fuel tax free. Senate Finance Committee bill was stalled. Congress were aware of the media attention this issue was generating. House moved a bill making techni- cal changes to certain tax laws. In- cluded in the bill was the relief we were seeking: off-highway users of diesel fuel would be allowed to pur- chase that fuel tax free. The senate Finance Committee once again endorsed the diesel fuel tax fix several weeks later, and it was soon approved by the full Sen- ate. A great deal of work still re- mained to secure the fix. Other pro- visions of the House and Senate bills were contentious, and members of the House and Senate assigned to develop a compromise bill seemed unable to resolve these differences. December 13, 1988, signed into law legislation to allow tax-free pur- chase of diesel fuel beginning Janu- ary 1, 1989. On another tax front, one of the more publicized "reforms" of the 1986 Tax Reform Act was elimina- tion of 100 percent deductibility for business meals and entertain- ment—the so-called "three martini lunch." However, Congress drafted this provision so broadly that it inadvertently applied to meals pro- vided to crew members on vessels. The House technical corrections measure mentioned above included language to restore full deductibility for crew meals as a result of AWO's work. However, there was no com- panion provision in the Senate. AWO and a maritime industry co- alition concentrated efforts on members of the House and Senate who would be negotiating a compro- mise bill. Despite the strenuous ob- jections of the Treasury Depart- ment, the final bill allows 100 per- cent deductibility of meals provided to crew members on vessels. AWO was also involved in many legislative areas other than tax is- sues, of course. 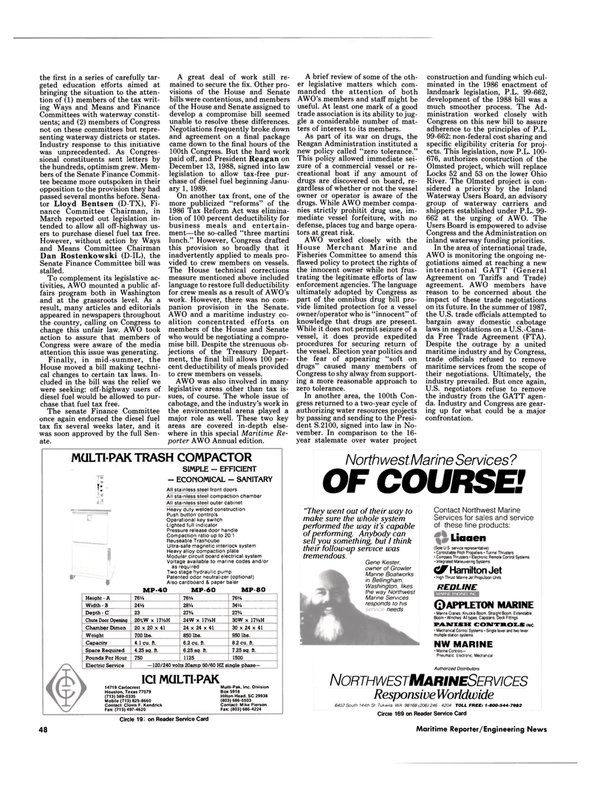 The whole issue of cabotage, and the industry's work in the environmental arena played a major role as well. These two key areas are covered in-depth else- where in this special Maritime Re- porter AWO Annual edition. Weight 700 lbs. 850 lbs. 950 lbs. Capacity 4.1 cu. ft. 6.2 cu. ft. 8.2 cu. ft.
Space Required 4.25 sq. ft. 6.25 sq. ft. 7.25 sq. ft.
AWO's members and staff might be useful. At least one mark of a good trade association is its ability to jug- gle a considerable number of mat- ters of interest to its members. Reagan Administration instituted a new policy called "zero tolerance." This policy allowed immediate sei- zure of a commercial vessel or re- creational boat if any amount of drugs are discovered on board, re- gardless of whether or not the vessel owner or operator is aware of the drugs. While AWO member compa- nies strictly prohitit drug use, im- mediate vessel forfeiture, with no defense, places tug and barge opera- tors at great risk. Fisheries Committee to amend this flawed policy to protect the rights of the innocent owner while not frus- trating the legitimate efforts of law enforcement agencies. The language ultimately adopted by Congress as part of the omnibus drug bill pro- vide limited protection for a vessel owner/operator who is "innocent" of knowledge that drugs are present. Congress to shy alway from support- ing a more reasonable approach to zero tolerance. Congress and the Administration on inland waterway funding priorities. Agreement on Tariffs and Trade) agreement. AWO members have reason to be concerned about the impact of these trade negotiations on its future. In the summer of 1987, the U.S. trade officials attempted to bargain away domestic cabotage laws in negotiations on a U.S.-Cana- da Free Trade Agreement (FTA). U.S. negotiators refuse to remove the industry from the GATT agen- da. Industry and Congress are gear- ing up for what could be a major confrontation.